As a student at the University of Bonn, in what was then West Germany, I became somewhat familiar with the two outstanding German literary figures, Günter Grass and Heinrich Böll. Both provide a certain insight into the world that was West Germany before reunification in 1989-1990. Both won the Nobel Prize for Literature, Böll in 1972 and Grass in 1999. Gunter Grass is best known for The Tin Drum (1959), the first volume of his Danzig Trilogy. The Tin Drum was made into a successful motion picture in 1979. While spending the summer of 1980 in Berkeley, I took advantage of the opportunity to see the film in a local theater. “You really must see it,” was the advice I was given repeatedly. So I did. A short while into the film, there was a scene where some people were at a beach. They pulled a horse’s severed head tied to a rope from the water and began to shake it. Eels began to fall from the neck. The camera kept going back and forth between the eels falling from the horse’s head and the same people at a dinner table eating plats filled with eels as if they were eating spaghetti. It was too much for me. I got up from my seat and walked out. As far as I can recall, that was the only movie I ever walked out of. Obviously it was not Grass the novelist that drew me to From Germany to Germany: Journal of the Year 1990. 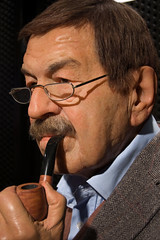 Rather it was my interest in Günter Grass as a political activist, supporter of the Social Democratic Party, and friend of Willy Brandt. Grass has been a witness to much of what is positive in the history of postwar Germany. He is one of the German authors who have tried to come to grips with Germany’s past and how it continues to haunt the present. From Germany to Germany is a journal Grass kept as he traveled through the newly reunited Germany between 1 January 1990 and 1 February 1991. In it Grass recorded his impression of what was happening during that memorable year. A whole host of well-known and not so well-known personalities from the cultural and political communities appear throughout the journal. He also comments on such mundane things as buying freshly caught “fluke and herring” off a fishing boat along the Baltic shore. Grass is not only an author, but also an artist. And so there are drawings executed during his journey scattered throughout the book. I find the one used on the cover of the book especially interesting. A very nice feature of the book is the collection of information at the back of the volume that serves to help the reader understand the text. These include an eighteen-page, alphabetical listing of the “Persons Mentioned in Grass’s Journal” with a brief identification. There is also a “Brief Chronology of Modern German History,” and a “Glossary” of terms that most American readers are not likely to be familiar with. This entry was posted in Book Reviews and tagged Danzig Trilogy, Günter Grass, Germany, Grass, Heinrich Böll, Willy Brandt. Bookmark the permalink.